Tomb Raider marks the third film appearance by the popular video game character and provides an origin story for main character Lara Croft. Based on the Crystal Dynamic’s 2013 prequel/ reboot of Square Enix’s character (and incorporating elements of the subsequent 2015 sequel) Tomb Raider shows us how Lara Croft become the stealthy, acrobatic, gun-toting archaeologist we are all familiar with. With her father missing for seven years Lara Croft (Alicia Vikander) must face the very real possibility that his last adventure lead to his death. However when she is presented with a puzzle box as part of her inheritance, Lara unlocks the secret past of Lord Richard Croft (Dominic West), that points to a mysterious island, and the tomb of a cursed Japanese Empress. Setting off in her father’s footsteps Lara discovers that there are other forces after the tomb, with their own nefarious designs, and soon Lara must race against Trinity to unlock its secrets first. To be brutally honest Tomb Raider is a missed opportunity. At every juncture it chooses the safest possible option for storytelling, content to mimic some of the sequences of the games or the genre that inspired it, without forging its own path. This doesn’t necessarily make it a bad film, but it does make it a mediocre one. Given the talent involved here, you can’t help but feel it’s a waste, and considering the usually solid Walton Goggins somnambulistic take on this piece’s villain, it seems the cast is aware of it. There is no sense of genuine stakes at play here. Most of the action sequences are obvious green screen effects and CG, making the whole play out like an unconvincing video game. There’s little immersion in the stunt work, and you at no time feel that Vikander’s Croft is in genuine peril. Tomb Raider just feels like one extended cut scene. Worse still, it seems like one we’ve seen before, as a lot of the traps and temple locations harken back to Indiana Jones, mimicking the famous trilo… um, quadrilogy. 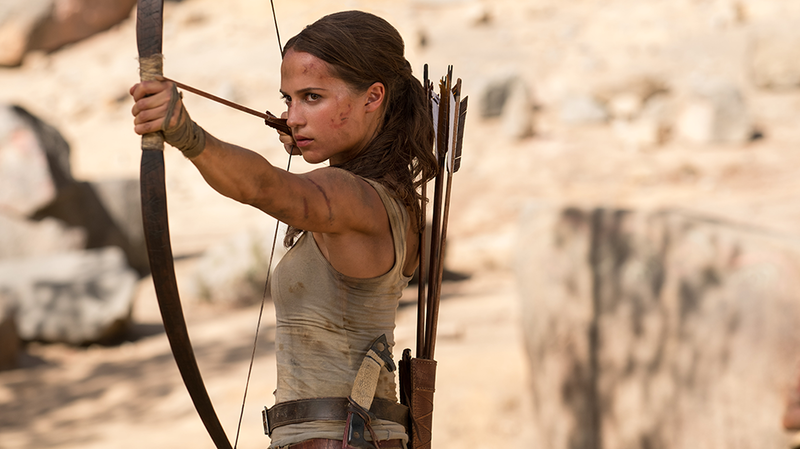 It’s understandable to pay homage to something that has so dominated the pulp genre, but by drawing constant comparisons Tomb Raider is not doing itself any favours. Still there’s a fair bit here that is also admirable. Vikander understands her character, and Tomb Raider does hit many of the core beats of the games that inspired it, bringing a number of fan favourite moments to the big screen. We get to see Croft manor in all it’s glory, a number of Lara’s costumes are referenced, and we have a re-enactment of the shocking moment that Lara is first forced to take a life in self defence (before going on to wrack up an impressive body count of henchman, endangered animals, and a dinosaur in the games). Even beyond the fan service Tomb Raider comes across as a competently directed, albeit workman like action adventure flick. The action sequences are well handled, they just fail to engage due to the significant use of CG. Ultimately Tomb Raider falls exactly where you’d expect it to, in that very average ground that has been carved out by so many video games adapted to the big screen. Which is a shame. Given the cast, the strong female action hero, and the few great moments that do occasionally shine through, it’s hard to escape the feeling that this was a script rewrite or two away from being something a lot better. As it is, Tomb Raider embraces it’s own mediocrity, but it’s difficult to imagine that audiences will return the favour.